You may think that since there is no sea in Paris, it is difficult to sail... Well, it's not true! There are about 10 recreation centers around Paris where you can enjoy sailing, windsurfing, kayaking... One of them (located in Choisy-le-Roy) is only about 15 minutes away from the center of Paris (check the list - in French only - here). Of course, I did not not take this photo there... But at the Tuileries gardens, where they also offer sailing... but with toy boats that they rent by the hour (for 4 euros)! God did I love that when I was a child LOL! I love to watch (and clandestinely photograph) the cute kids sailing these colorful boats. I can just picture you (wearing short pants, I'm afraid). I'll bet you were adorable! This looks more like a Monet than this Monet. Oh that sounds like so much fun. And the picture is lovely. OH Eric, maybe I"m closing in on being a "sort of " Parisian. I took one look at that photo and said, " Jardins des Tuilieries"! I recognized those boats immediately. Thank you for bringing back some nice nice memories. 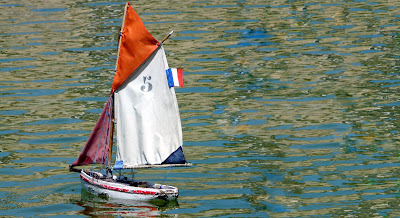 This reminds me of the Judy Collins' song..."My father always promised us that we would live in France, We'd go boating on the Seine, and I would learn to dance..."
If I had a toy boat, I'd want one like that. Toy boat, toy boat, toy boat...still can't say that three times fast. Lovely photo, lovely memories. Lovely! I would like to go sailing, I haven't been since I was a child! Great shot. Have fond memories of the Tuileries as well. Didn't we used to pay to sit on the chairs back then ? Looks like a painting, very lovely. @TF...I actually do remember paying to sit on the chairs in the Tuileries also...and I think it was 1973...Hmmm?